Rudolf Dreikurs taught, “A child needs encouragement like a plant needs water.” In other words, encouragement is essential. Children may not die without encouragement, but they certainly wither. 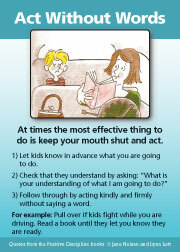 Since encouragement is so essential, it would be good for parents to know what encouragement means and how to do it. Let’s start with the difference between praise and encouragement. It would be helpful to download the file "Differences Between Praise and Encouragement". Is it Praise or Encouragement? As Dreikurs said, “Encourage the deed [or effort], not the doer.” In other words, instead of, “You got an A, I’m so proud of you,” try, “Congratulations! You worked hard. You deserve it.” A subtle difference, but it will change the perception of your child. The differences between encouragement and praise can be difficult to grasp for those who believe in praise and have seen immediate results. They have seen children respond to praise with beaming faces. However, they don’t think about the long-term effects. Praise is not encouraging because it teaches children to become “approval junkies.” They learn to depend on others to evaluate their worth. Encouragement leads to self reflection and self evaluation. Now let's get back to the fact that children like praise. (So do I.) Praise is a like candy. A little can be very satisfying. Too much can cause problems. Awareness is the key. 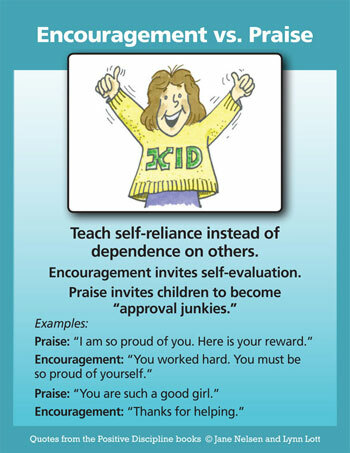 Notice if your kids are becoming addicted to praise—need it all the time. Encouragement is helping your children develop courage—courage to grow and develop into the people they want to be, to feel capable, to be resilient, to enjoy life, to be happy, contributing members of society, and, as Dreikurs said, “To have the courage to be imperfect;” to feel free to make mistakes and to learn from them. Family Meetings where children learn to give and receive compliments and learn to brainstorm for solutions to problems. Curiosity Questions to invite children how to think instead of what to think—and to give them a sense of choice to use their personal power for social responsibility. Letting Go so children have opportunities to learn and grow—mistakes and all. Show Faith in children so they can develop faith in themselves. Spending Special Time to make sure the message of love gets through. When I was growing up, I didn’t know that anger is just a feeling. To me anger meant withdrawal of love. My mother didn’t tell me she was angry. She just wouldn’t speak to me for days. However, she did “speak” loud and clear with the look of disgust and disapproval on her face whenever she looked at me during those days of silence . My childlike mind twisted that to mean that people would stop loving me if I got angry. Lynn Lott, co-author of several of the Positive Discipline books, and my dear friend and mentor, taught me that feelings are always okay. What we do about those feelings may not be okay. In other words, feeling angry is okay. Withdrawing love, or the many ways I expressed my anger, is not okay, (more about that later). Knowing that anger is just a feeling, is always okay and may help change some old childhood beliefs. Recently I was feeling angry with a friend. Instead of following my previous pattern of trying to talk myself out of my anger, or making snide remarks, I said to my friend, "I want to tell you how angry I am, and I want you to still love me." I did and she did. When I took responsibility for my anger, instead of dancing around it, my friend was able to share her point of view. Then we apologized for our misperceptions and felt great again. Many adults have not learned the valuable language of feelings. We are afraid that if we feel something we have to do something hurtful to others or ourselves. This is usually based on past experiences. 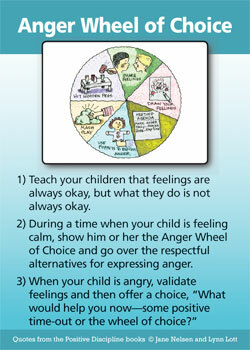 The Anger Wheel of Choice can help our children learn another way. During a calm time you can teach them that what they feel is always okay, and that what they do is not okay if the “doing” hurts others or themselves. You can show them the wheel of choice and teach them these alternative ways of expressing their anger that does not hurt others. It is just possible, that if children learn these life skills, they would feel more capable and confident, would experience more loving relationships with others, and would be instruments of peace in the world. The Avoid Pampering tool card is a perfect follow-up to the tool card of Show Faith. 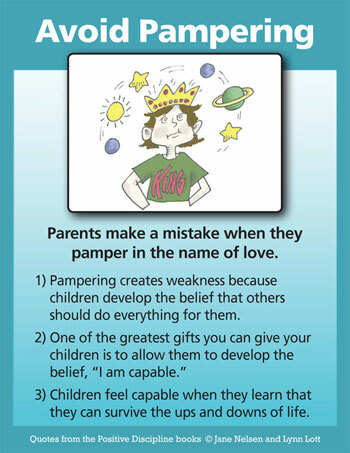 When we avoid pampering, we are in essence showing faith in our children. But first let's define what we mean by "Avoid Pampering." We are NOT talking about love, affection and connection. Giving hugs is not pampering. Giving compliments is not pampering. Validating feelings is not pampering. Parents often do things for their children for expediency. They may be in a hurry or they are afraid their children will not do it "right" or perfectly. That is why it is important to "take time for training." This means showing them how and then letting them practice. Do things "with" young children until they are old enough and practiced enough to graduate to doing things by themselves. It will still often take longer and not be perfect, but remember we are striving for long-term results. We need to give our children opportunities to become responsible, capable young people. 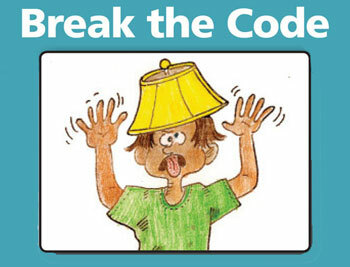 When children are misbehaving, they are speaking to adults in code? A misbehaving child is a discouraged child. The primary goal of all children is to feel a sense of belonging and significance. Too often they form a mistaken belief about how to seek belonging and significance—as explained in the Mistaken Goal Chart. Unless adults know how to break the code—children usually experience the opposite of belonging and significance. Click on this link: Mistaken Goal Chart so you can follow along as I explain the code. The second clue is your reaction to the misbehavior. Again, you heard right. The third column of the Mistaken Goal Chart summarizes adult behaviors that actually feed a child’s discouragement. Let’s take an example. Suppose your child is interrupting. You feel annoyed. 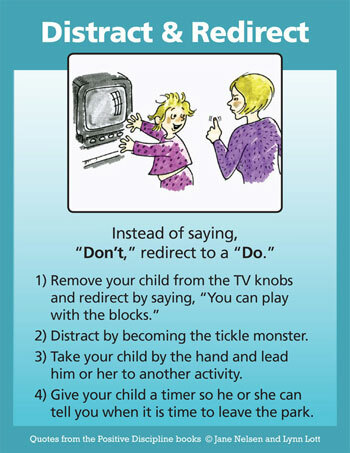 You scold your child for interrupting. She stops for a few minutes (your third clue that the mistaken goal is Undue Attention per the fourth column of the Mistaken Goal Chart). By scolding, you have reinforced the discouragement. In a few minutes your child will try harder to get undue attention. Most parents don’t understand that there is a belief behind every behavior. Thus they make the mistake of trying to change just the behavior. The behavior will stop only when the belief behind the behavior is changed. 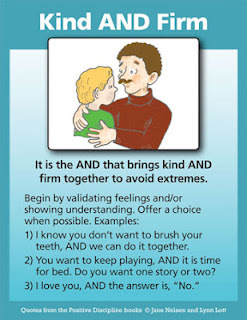 Breaking the code helps you understand the discouraging belief behind the behavior and what the child really needs to feel encouraged enough to change his or her belief. You have read an example of breaking the code for the mistaken goal of Undue Attention. The following activity will help you break the code for specific behaviors that are challenging to you so that you can be encouraging to your child and to yourself. 1. Describe a challenging behavior you are experiencing with your child. 2. Identify your feelings. Remember that a feeling can be described with just one word. (Frustrated doesn’t count because it is a generic feeling that can be narrowed down to a more specific feeling. In the beginning you may need to look at the second column of the Mistaken Goal Chart to find the feelings that fit for you.) Write your feeling or feelings below. 3. Describe what you usually do in response to the challenging behavior? 4. Now get into your child’s world. How would you feel if you were a child and your parent did or said what you did or said? 5. Look at the sixth column of the Mistaken Goal Chart to “break the code” and identify what the child needs. 6. Choose a suggestion from the last column of the Mistaken Goal Chart that you would like to try the next time you encounter the challenging behavior. Describe how you think this might be encouraging to your child and how it might help your child revise his or her belief about how to find belonging and significance. 7. Journal about the results of what you did. If it didn’t seem to work to change the behavior, is it possible that your child is at least making a new decision. Use this worksheet until it becomes second nature and you will earn an honorary degree as a behavior detective and encouragement expert. One of the biggest mistakes some parents and teachers make, when they decide to do Positive Discipline, is becoming too permissive because they don’t want to be punitive. Some mistakenly believe they are being kind when they rescue their children, and protect them from all disappointment. This is not being kind; it is being permissive. Being kind means to be respectful of the child and of yourself. It is not respectful to pamper children. It is not respectful to rescue them from every disappointment so they don’t have the opportunity to develop their disappointment muscles. It is respectful to validate their feelings, "I can see that you are disappointed (or angry, or upset, etc.)." Then it is respectful to have faith in children that they can survive disappointment and develop a sense of capability in the process. It is also important to take time for training. Adults often expect children to accomplish tasks for which there has not been adequate training. This is more typical in homes than in schools. Parents may expect children to clean their rooms, but never teach them how. Children go into their messy rooms and feel overwhelmed. It may be helpful to clean the room with your children until they have more training. This is also a great way to create connection. Be sure and use "Curiosity Questions." (We will be covering curiosity questions in a later blog post.) Instead of telling children what to do, ask curiosity questions. "Where do your dirty clothes go?" "What do we need to do before we can vacuum the floor?" Children are great problem solvers when we give them a chance. Patience is probably the most difficult part of showing faith in our children. It is almost always more expedient to solve problems for our children. This is particularly true when we are under time pressures. In these cases we can take time later to explore solutions for the future. Ask your children exploratory questions. "What happened?" "What caused it to happen?" "What did you learn?" "What can you do in the future?" When time pressures are not an issue, practice having patience with your children. Allow them to problem solve on their own. Allow them to feel a little disappointment. Allow them to work through their feelings. They will need these skills in the future. It may help to remember that who your children are today, is not who they will be forever. Someday they will be nagging their own children to put their dishes in the sink and to clean their rooms. Remember that example is the best teacher. Model what you want for your children, take time for training so they learn skills, have regular family meetings, and then have lots of faith in them to become the best they can be. I continued to do this every morning. It wasn’t long before Mary got used to having me there. I didn’t ask any questions, but before long, Mary would chat away about all the things that were going on in her life. Children often feel interrogated. You may be ready to talk when your child isn’t. Experiment by serving cookies without asking, “How was your day?” Just sit there. Perhaps children who resist questions will respond when you make yourself available and just listen. Click Here if you do not see the MP3 player. "How should I know where your books are? Where did you leave them? How many times have I told you to put them where they belong? If you don't hurry up and eat, you're just going to have to go to school hungry. You're still not dressed, and the bus will be here in five minutes! I'm not going to take you to school if you're not ready—and I mean it! (While driving Jimmy to school), “Jimmy, when will you ever learn? This is absolutely the last time I'll drive you to school when you miss the bus. You've got to learn to be more responsible!" What do you think? Is this the last time Jimmy's mother will drive him to school when he misses the bus? No. Jimmy is very intelligent. He knows his mother’s threats are meaningless. He has heard the threats many times and knows his mother will drive him to school when he's late. Jimmy's mother is right about one thing: Jimmy should learn to be more responsible. But through morning scenes like these, she is teaching him to be less responsible. She is the responsible party when she keeps reminding him of everything he needs to do. 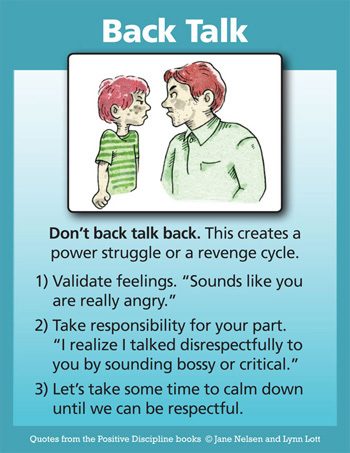 Children do not learn from the lecturing, nagging, scolding, and threatening. Actually, they do learn from these methods—just not what you hope they will learn. They learn to engage in power-struggles, resistance, rebellion, and revenge cycles. They may learn to comply and become approval junkies—more concerned about pleasing others to feel a sense of belonging and significance than to cooperate out of mutual respect. 1. Involve children in the problem-solving process. When children are involved in solutions they have ownership and motivation to follow the plans they have helped create. 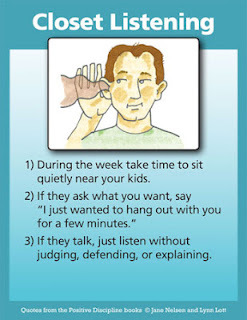 Sit down with your children during a family meeting or a more informal session. Present the problem and ask for suggestions, "We are having a lot of morning hassles. What ideas do you have on how we could solve this problem?" Your attitude and tone of voice in presenting the problem is crucial. Humiliation invites resistance and defensiveness. Respect invites cooperation. Write down every suggestion. You can make suggestions too, but only after allowing plenty of time for theirs first. Select the suggestions that everyone can agree upon and discuss exactly how it will be implemented. Willing agreement by everyone involved is essential so that everyone feels the desire to cooperate. Ownership and motivation are not the only benefits of getting children involved in the problem-solving process. They usually have great ideas when we allow them to contribute. They also develop the perception that they are capable and the a feeling of self-confidence that comes from making valuable contributions. And, it helps you let go. 2. Involve children in the creation of routines. One of the best ways to avoid morning hassles is by starting the night before with a routine that helps avoid bedtime hassles, so start with the creation of a bedtime routine with your children. After your child makes a list (either writing herself or with you transcribing) of everything she can think of to include as part of her bedtime routine, ask, “What about getting your things ready for the next morning?" During this time she can choose the clothes she wants to wear the next morning. Have you noticed that when children are under time pressures they always want to wear the special shirt that they can't find anywhere? If they do finally find it at the bottom of the clothes hamper they insist it has to be washed and ironed before school. On the other hand, when they have plenty of time it seems easy for them to choose something in their closet and lay it out for the next morning. During this time they can also find their shoes, socks, books, homework, and whatever else they need for the next morning. Next, help your children create their own morning routine chart. Let your children decide what time they need to get up, how much time they need to get ready, what part they will play in the breakfast routine, and rules about the television not being turned on until everything is done and their is time left over. Young children love it when you take photos of them doing each task on their routine charts and let them post the photo next to the task, and then hang the routine charts where they can be easily seen. 4. Let go by allowing children to experience natural or logical consequences. Natural consequences are what happens naturally, without adult interference. When you stand in the rain, you get wet; when you don't eat, you get hungry; when you forget your coat, you get cold. Logical consequences require adult intervention. Obviously, you aren't going to allow your children to experience the natural consequences of playing in the middle of a busy street, or when a child is throwing rocks at another person, an adult needs to step in, because the child is interfering with the rights of another person. Also, when the results of the child's behavior do not seem like a problem to the child, natural consequences (such as eating junk food and not brushing their teeth) are ineffective. 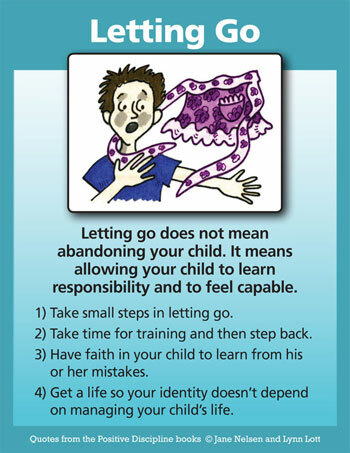 Children can learn a great deal from natural and logical consequences to help them develop responsibility if you are willing to let go. Jimmy will learn to be responsible when his mother stays out of the way and allows him to experience the consequences of being late. 6. Follow-through with actions, not words. When children test your new plan, the fewer words you use the better. Keep your mouth shut and act. If Jimmy continues to dawdle and misses his bus, don't resort to "I told you so." Just follow through on agreed-upon consequences. The few words you do use to ensure firmness with dignity and respect should be stated in a kind and friendly manner. "I'm sorry you missed your bus, Jimmy. We can talk about your walking experience tomorrow." Ignore the temptation to become involved in a power struggle or revenge cycle. Children will do their best to get you sucked into your usual response. When Jimmy says, "Please drive me, Mom. I won't be late again," don't give in. Kindly and firmly remind him of your decision. Then jump in the shower so you're not tempted to get involved in further discussion! 7. Things may get worse before they get better. Children may try hard to get the response they are used to getting from you. 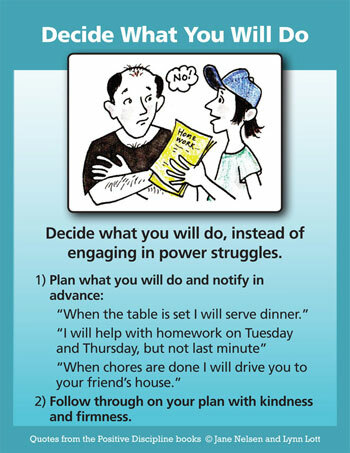 Be consistent with your new plan of action and children will learn a new response-ability. If Jimmy is late and misses his bus, he will have to experience the natural consequence—walking to school. If Jimmy doesn't like walking to school, it won't be long before he begins to take responsibility for himself. 8. Have faith in your children. Children learn to be capable people by spending time with people who believe they are capable. For example, when Jimmy's mother believes that he can get himself up and ready for school without her hassling him constantly, Jimmy will also believe that he can accomplish this feat on his own. It gives him a new sense of self-confidence—even at age six. If he can handle getting himself up and ready for school, what can't he handle? If you want to turn morning hassles into morning bliss, practice the steps for letting go outlined above. Teach your children the joys of responsibility, cooperation, and self-discipline. How much better to face a morning full of love, understanding, and fun than a morning full of hassles, criticism, and arguments. Try a silent (secret) signal. (Kids love the secret part—especially when they have helped create it.) 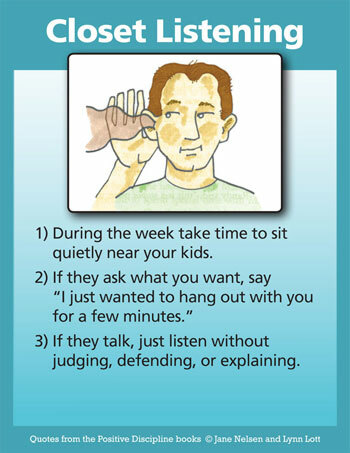 Creating silent signals can be part of “taking time for training” (another great tool card). My daughter, Mary Nelsen Tamborski, took time for training with four-year-old Greyson about interrupting. (Remember, that time for training takes place during calm times—not at the time of conflict.) They decided on a secret signal and then they practiced. When Mom is talking to someone else, Greyson squeezes her hand to let her know he wants to say something. She puts her hand on his shoulder to let him know she will finish as soon as she can and listen to him. Greyson seldom interrupted after that. It was obvious that he felt pleased about their secret code. The silent signal illustrated on the Positive Discipline Tool Card is to point to your watch when you have agreed (together) on a specific time that something should be done. Remember to smile while you are pointing. Following are some more examples of using Silent Signals. Mr. Perry, a principal, decided to attend a parent study group at his school. He made it clear to the group that he was attending as a parent who would like to learn some skills to use with his own children. One night he asked the group to help him solve the problem of getting his son, Mike, to take out the garbage. Mike always agreed to do it, but never did without constant reminders. The group gave Mr. Perry several suggestions, such as turning the television off until it was done or giving Mike a choice as to when he would do it. One parent suggested they try the silent signal of turning Mike’s empty plate over at the dinner table if he forgot to take the garbage out before dinner. Mr. Perry decided to try this. First, the family discussed the garbage problem at a family meeting. Mike again reaffirmed that he would do it. Mrs. Perry said, "We appreciate your willingness to help, but we also realize how easy it is to forget. Would it be okay with you if we use a silent signal so that we can stop nagging?" Mike wanted to know what kind of signal. Mr. Perry explained the idea of turning his empty plate over at the dinner table. If he came to the table and saw his plate turned over, that would remind him. He could then empty the garbage before coming to the table. Mike said, "That’s okay with me." It was eight days before Mike forgot to empty the garbage. (When children are involved in a problem solving discussion, they usually cooperate for a while before testing the plan.) When he came to the table and saw his plate turned over, Mike started having a temper tantrum. He whined, "I’m hungry! I’ll take the garbage out later! This is really dumb!" I’m sure you can imagine how difficult it was for Mom and Dad to ignore this rebellious behavior. Most parents would want to say, "Come on, Mike, you agreed, now stop acting like a baby!" If Mike continued his misbehavior, they would want to forget the plan and use punishment (which would stop the present rebellious behavior, but would not solve the problem of getting the garbage emptied and allow Mike to learn responsibility). Mr. and Mrs. Perry continued to ignore Mike’s temper tantrum, even when he stomped into the kitchen, got the garbage, slammed the garage door on his way out, and then sulked and banged his fork on his plate all during dinner. The next day Mike remembered to empty the garbage and was very pleasant during dinner. As a result of their consistency in following the agreed upon plan, Mike did not forget to empty the garbage for two more weeks. When he saw his empty plate turned over again, he said, "Oh, yeah." He then took the garbage out, came to the table, turned his plate over, and pleasantly ate with the rest of the family. Another reason it is difficult for parents to ignore rebellious misbehavior is the feeling that they are letting children get away with something. They feel they are neglecting their duty to do something about it. This could be true, if there weren’t some plan or purpose behind the ignoring. Mr. and Mrs. Perry let Mike get away with his temporary outburst (remember, things often get worse before they get better) but since it was part of an agreed upon plan, they solved the problem of continuous nagging over neglected chores. Mrs. Beal was frustrated because it irritated her so much when the children would come home from school and dump their books on the couch. Constant nagging was not producing any change. During a family meeting she told her children she didn’t want to yell and nag anymore about this problem. She suggested the silent signal of putting a pillow slip over the television as a reminder that there were books on the couch. The children agreed to this plan, and it worked very well. Mother no longer got involved beyond the signal. When the children saw the pillow slip, they either picked up their own books or reminded someone else to. Several weeks later, Mrs. Beal wanted to watch her favorite TV program after the children had gone to school. She was surprised to find a pillow slip on the television. She looked at the couch and saw the packages she had left there the night before, when she was in a hurry to fix dinner. The whole family had a good laugh over this turn of events. They enjoyed this method, and from then on the children thought of many silent signals as solutions to problems. Mrs. Reed likes to use silent signals in her fifth-grade classroom. She teaches them to her students almost as a second language on the first day of school. One is to have them give her the silent signal of sitting quietly with their hands clasped on top of their desks when they were ready to listen. When she wants them to turn around and sit down during class or an assembly, she raises her right index finger and makes two small circles and then two up and down motions in the air to the rhythm of the words, "Turn around and sit down." She also taught them a signal for quiet during extreme noise. She would clap her hands once. Everyone who heard the single clap would clap once. Then she would clap twice. By now, several students had heard the echo clap of their classmates and were ready to join the response of two claps. Two claps were usually enough to get everyone quiet. Occasionally it would take three claps before everyone would hear and echo with three claps. 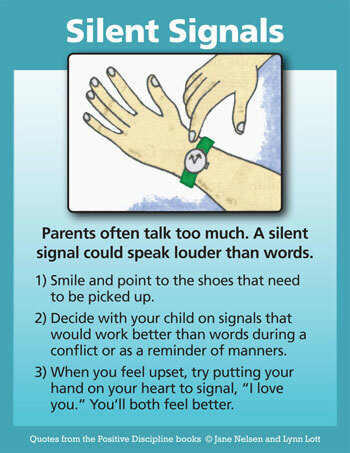 As you can see, the Positive Discipline Tool of Silent Signals can help solve problems, help children follow-through and help parents avoid constant nagging and reminding. 1. Create your own special time-out area and let your children know when you need to use it. Some parents are uncomfortable with this solution, especially when dealing with younger children. But if your children are older and you can set up this system in advance, it can be quite effective. It is nearly impossible to solve problems at the time of conflict when both the child and the parent have flipped their lid. The result is distance and hurt feelings. Usually followed by guilt! Why not let your children know that you are taking a time out. Remove yourself from the situation and get centered before attempting to solve the problem. How you take your time-out is up to you. Maybe you will go to your room. Maybe you will go for a walk. Maybe call a close friend and discuss the problem. Whatever you decide, the important thing is to take time to cool off before addressing the problem. 2. If you can't leave the scene, count to 10 or take deep breaths. This is a good solution if you have younger children or the situation requires your presence. It is also okay to share what you are feeling. "I'm so angry right now, I need to calm down before we talk." Kids need to know that what they feel is always okay, but what they do is not always okay. You model this by sharing your feelings without reacting to them and without blaming your children for your feelings. Avoid saying, "You make me so angry." 3. When you make mistakes, apologize to your children. As you heard in the podcast above, I eventually calmed down and apologized to my daughter. Children are wonderfully forgiving when we take time to sincerely apologize when we lose control. During lectures I ask, "How many have you have apologized to a child?" Every hand goes up. I then ask, "What do they say?" The Universal response from children when parents apologize is, "That's okay." By apologizing, you have created a connection (closeness and trust). In this atmosphere you can work together for a solution. Once again you have demonstrated that mistakes are opportunities to learn and that you can then focus on solutions. A foundation of Positive Discipline is to be kind and firm at the same time. Some parents are kind, but not firm. Others are firm, but not kind. Many parents vacillate between the two—being too kind until they can’t stand their kids (who develop an entitlement attitude) and then being too firm until they can’t stand themselves (feeling like tyrants). It is interesting to note how often two people with opposing philosophies about kindness and firmness get married. One has a tendency to be just a little too lenient. The other has a tendency to be just a little too strict. Then the lenient parent thinks he or she needs to be more lenient to make up for the mean old strict parent. The strict parent thinks he or she needs to be more strict to make up for the wishy-washy lenient parent—so they get further and further apart and fight about who is right and who is wrong. In truth they are both wrong. The trick is to be kind and firm and the same time. Putting kind and firm together can be a challenge for parents who have a habit of going to one extreme or the other. I know you would rather watch TV than do your homework (show understanding), AND homework needs to be done first. The mother bird knows instinctively when it is time to push her baby bird from the nest so it will learn to fly. If we didn’t know better we might think this is not very nice of the mother bird. If the baby bird could talk, it might be saying, “No. I don’t want to leave the nest. Don’t be so mean. That’s not fair.” However, we know the baby bird would not learn to fly if the mother bird did not provide that important push. Kind is not always nice. It would be very unkind to allow her baby to be handicapped for life by pampering—an unkindness practiced by many parents today. All of theses parenting methods create weakness. You may be surprised to see, “making sure children never suffer,” as a mistake in the name of kindness. The following story of the little boy and the butterfly may help you understand how rescuing children from all suffering creates weakness. A little boy felt sorry for a butterfly struggling to emerge from its chrysalis. He decided to help so he could save the butterfly from the struggle. So he peeled the chrysalis open for the butterfly. The little boy was so excited to watch the butterfly spread its wings and fly off into the sky. Then he was horrified as he watched the butterfly drift to the ground and die because it did not have the muscle strength to keep flying. Like the little boy, parents too often (in the name of love) want to protect their children from struggle. They don’t realize that their children need to struggle, to deal with disappointment, to solve their own problems, so they can develop their emotional muscles and develop the skills necessary for the even bigger struggles they will encounter throughout their lives. It is important that parents do not make children suffer, but sometimes it is most helpful to “allow” them to suffer with support. For example, suppose a child “suffers” because she can’t have the toy she wants. Allowing her to suffer through this experience can help her develop her resiliency muscles. She learns that she can survive the ups and downs of life—leading to a sense of capability and competency. The support part is that you validate her feelings, but avoid rescuing or lecturing. Instead, parents can offer loving support. “I can see this is very upsetting to you. It can be very disappointing when we don’t get what we want.” Period. I say, “period,” because some parents even overdo validating feelings—going on and on in the hopes that validating feelings will take away the suffering. 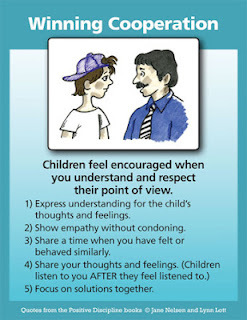 Validate a child’s feelings and then allow her to recover from those feelings. “I can see you are very disappointed that you didn’t get a better grade.” Then comes the tough part—no rescuing and no lectures. Simply allow her to discover that she can get over her disappointment and figure out what might increase her chances of getting what she wants in the future. Many people who are drawn to Positive Discipline err on the side of kindness. They are against punishment, but don’t realize that firmness is necessary to avoid permissiveness. Permissiveness is not healthy for children because they are likely to decide, “Love means getting others to take care of me and give me everything I want." 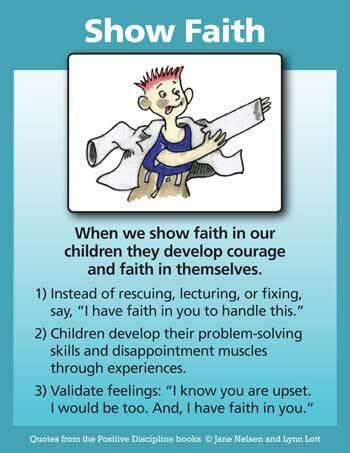 Have faith in your children that they can learn and grow from suffering—especially in a supportive environment. Understand that kind is not always nice, short term. True kindness and firmness together provide an environment where children can develop the “wings” they need to soar through life. An excerpt from the book Positive Discipline by Dr. Jane Nelsen. Did you feel motivated to do better? If so, was it a good feeling, or was it based on negative feelings about yourself and/or the other person? Did you feel motivated to give up or to cover up so you could avoid future humiliation? Or, did you want to become an approval junkie—giving up a big part of yourself in order to please others? Children do not develop positive characteristics based on the feelings and subconscious decisions they make as a result of punishment. Parents and teachers who don’t like excessive control or permissiveness, but don’t know what else to do, may switch back and forth in confusion between two ineffective alternatives. They try excessive control until they can’t stand themselves for sounding so tyrannical. They then switch to permissiveness until they can’t stand how spoiled and demanding the children get—so they go back to excessive control. What is the price when excessive control seems to work with some children? Research has shown that children who experience a great deal of punishment become either rebellious or fearfully submissive. Positive Discipline does not include any blame, shame, or pain (physical or emotional) as motivators. On the other hand, permissiveness is humiliating to adults and children and creates unhealthy co-dependence instead of self-reliance and cooperation. Since many parents and teachers believe the only alternative to giving up excessive control and strictness is permissiveness, it is important that we define discipline. Discipline is a word that is often misused. Many people equate discipline with punishment—or at least believe that punishment is the way to help people achieve discipline. However, discipline comes from the Latin word discipulus or disciplini which means a follower of truth, principle, or a venerated leader. Children and students will not become followers of truth and principle unless their motivation comes from an internal locus of control—until they learn self-discipline. Both punishment and reward come from an external locus of control. If Not Strictness, and Not Permissiveness—Then What? Positive Discipline is an approach that does not include excessive control or permissiveness. Positive Discipline is based on mutual respect and cooperation and using kindness and firmness at the same time as the foundation for teaching life competencies based on an inner locus of control. We stress the importance of making a connection before correction; and involving children to focus on solutions instead of punishing for mistakes. 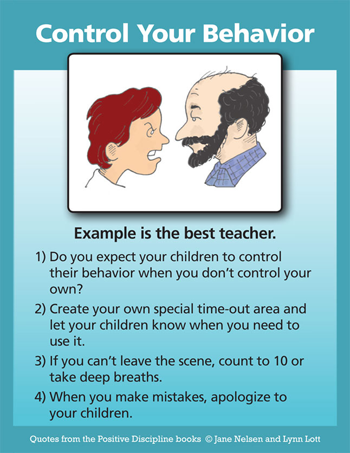 When adults use excessive control, it is their responsibility to be constantly in charge of children’s behavior. The most popular form of excessive control used by parents and teachers is a system of rewards and punishment. With this system, adults must catch children being "good" so they can give rewards and catch them being "bad" so they can dole out punishment. Who is being responsible? Obviously it is the adult; so what happens when the adult is not around? Children do not learn to be responsible for their own behavior. They do not learn to do the right thing when no one is looking. It is interesting to note how often controlling adults complain about irresponsibility in children without realizing they are training children to be irresponsible. Permissiveness also teaches irresponsibility because adults and children both relinquish responsibility. 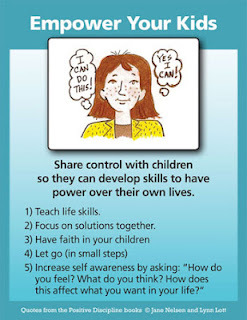 Invites children to discover how capable they are and to use their personal power in construc- tive ways. Punishment does not meet any of these criteria. Every method taught in Positive Discipline does. The first criteria, kindness and firmness at the same time is a cornerstone concept for Positive Discipline. Rudolf Dreikurs taught the importance of being both kind and firm. Kindness is important to show respect for the child. Firmness is important to show respect for ourselves and for the needs of the situation. Authoritarian methods usually lack kindness. Permissive methods lack firmness. Kindness and firmness are essential for positive discipline. Many parents and teachers struggle with this concept for several reasons. One is that they often don’t feel like being kind when a child has pushed their buttons. Again adults want children to control their behavior when adults don’t control their own behavior? Often, it is the adults who should take some positive time-out until they can feel better so they can do better. Another reason adults have difficulty being kind and firm at the same time is that they don’t know what kind and firm looks like. They may be stuck in the vicious cycle of being too firm when upset—or because they don’t know what else to do; and then being too kind to make up for being too firm. Tune in next week to learn more about the Positive Discipline Tool of Kindness and Firmness at the Same Time. by Jane Nelsen and Lynn Lott. 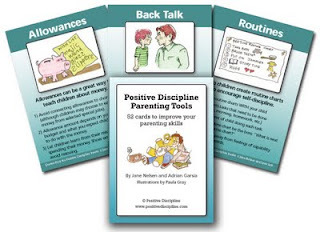 A friend asked me if Positive Discipline was a program to teach parents to manage their children. I said, "No, it is a program to help parents empower their children to manage themselves." You may be vividly aware of how skilled most of us are in using enabling responses to our children, and how unskilled we are in using empowering responses. 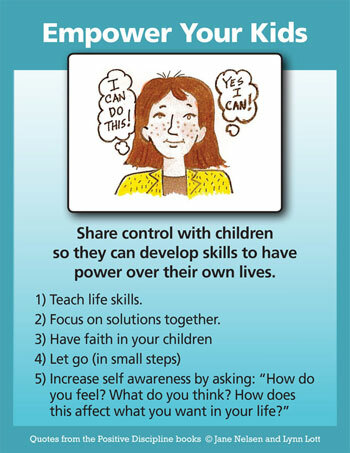 Parents who are used to controlling and rescuing may have a difficult time seeing the benefit of empowering statements. SHOW FAITH: "I have faith in you. I trust you to figure out what you need. I know that when it's important to you, you'll know what to do." RESPECT PRIVACY: "I respect your privacy and want you to know I'm available if you want to discuss this with me." EXPRESS YOUR LIMITS: "I'm not willing to go to school to bail you out. When your teacher calls, I'll hand the phone to you or tell her she'll need to discuss it with you. "A respectful attitude and tone of voice is essential. LISTEN WITHOUT FIXING OR JUDGING: "I would like to hear what this means for you." CONTROL YOUR OWN BEHAVIOR: "I'm willing to take you to the library when we come to an agreement in advance for a convenient time, but I'm not willing to get involved at the last minute." "If you need my help with your homework, please let me know in advance." LET GO OF THEIR ISSUES: "I hope you'll go to college, but I'm not sure it's important to you." AGREEMENT NOT RULES: "Could we sit down and see if we can work on a plan regarding homework that we both can live with?" LOVE AND ENCOURAGE: "I love you just the way you are and respect you to choose what is right for you." ASK FOR HELP: "I need your help. Can you explain to me why it isn't important to you to do your homework?" SHARE YOUR FEELINGS: Share your truth by using the "I feel ______ because _______ and I wish" process without expecting anyone else to feel the same or grant your wish. This is a great model for children to acknowledge their feelings and wishes without expectations. "I feel upset when you don't do your homework because I value education so much and think it could be very beneficial to you in your life and I really wish you would do it. JOINT PROBLEM SOLVING: "What is your picture of what is going on regarding your homework? Would you be willing to hear my concerns? Could we brainstorm together on some possible solutions?" RESPECTFUL COMMUNICATION: "I'm feeling too upset to talk about this right now. Let's put it on the agenda for the family meeting so we can talk about it when I'm not so emotional." INFORMATION VS. ORDERS: "I notice you spend a lot of time watching television and talking on the phone during the time you have set aside for homework." "I notice you often leave your homework until the last minute and then feel discouraged about getting it done." If you are used to using short-range solutions of control and rescuing, you might not realize how powerful these empowering statements are. Empowering statements and actions are important because they turn control over to your kids so they have power over their own lives. This power often leads to mistakes and failure. When you understand and trust that learning from mistakes and failure is an important part of a successful life process, you may find it easier to use the empowering statements. If what you are currently doing isn’t working, take a leap of faith and work on using empowering statements with your kids. The Jones family is very excited. They have just finished planning a day at the beach. Seven-year-old Jason and five-year-old Jenny have promised that they won’t fight. Mr. Jones, has warned, “If you do, we’ll turn around and come back.” “We won’t, we won’t,” promise Jason and Jenny again. And so the story goes. Throughout the day Jason and Jenny fight, and Mr. and Mrs. Jones make threats. At the end of the day, Mr. and Mrs. Jones are angry and threaten never to take the kids anywhere again. Jason and Jenny feel bad that they have made their parents so miserable. They are beginning to believe they really are bad kids—and they keep living up to their reputation. Now let’s visit the Smith family. They have just planned their trip to the zoo during their weekly family meeting. Part of the planning included a discussion about limits and solutions. Mr. and Mrs. Smith have told Susan and Sam how miserable they feel when they fight. The kids promise they won’t. Mr. Smith said, “I appreciate that, and I think we should come up with a plan for what will happen if you forget.” The kids keep insisting they won’t fight. Mr. and Mrs. Smith know their children have good intentions, and they are also very familiar with the pattern of good intentions gone awry. So, they have decided what they will do and they will follow through. Mrs. Smith says, “Well then, is it okay with you if we stop the car if you do forget? We don’t think it is safe to drive when you are fighting, so we’ll just pull over to the side of the road and wait for you to stop. You can let us know when you are ready for us to drive again. How do you feel about that solution?” Both kids agree with innocent enthusiasm. About 30 minutes later another fight starts. Mom starts to pull over to the side of the road. Both kids cry out in unison, “We’ll stop. We’re ready to keep driving.” There was no more fighting for the rest of the day, and the Smiths enjoyed a wonderful day at the zoo. What is the difference between the Jones family and the Smith family? Are Jason and Jenny really “bad” kids?” No, the difference is that the Smith family is helping their children learn cooperation and problem solving skills while the Jones family is helping their children learn manipulation skills. Mr. and Mrs. Smith demonstrate that they say what they mean and mean what they say by using kind and firm follow through. Mr. and Mrs. Jones don’t. They used angry threats. This had a temporary effect, but the kids would soon be fighting again. Mr. and Mrs. Smith stopped using words and instead followed through with kind and firm action. It took a little longer for the kids to catch on, but once they did it had a longer lasting effect. Because they are kids, they just had to test the waters one more time. When their parents started to follow through again the kids knew they meant what they said. They were left with the feeling, not that they were bad kids, but that they were clever enough to figure out a solution to the problem and that cooperation was the most effective alternative. A primary theme of Positive Discipline is to focus on solutions. The wheel of choice provides an excellent way to focus on solutions, especially when kids are involved in creating the Wheel of Choice. Some parents and teachers have their kids make the wheel of choice from scratch. This Wheel of Choice was created by 3-year-old Jake with the help of his mom, Laura Beth. Jake chose the clip art he wanted to represent some choices. His Mom, shared the following success story. Jake used his Wheel of Choice today. Jake and his sister (17 months old) were sitting on the sofa sharing a book. His sister, took the book and Jake immediately flipped his lid. He yelled at her, grabbed the book, made her cry. She grabbed it back and I slowly walked in. I asked Jake if he’d like to use his Wheel Of Choice to help—and he actually said YES! He chose to “share his toys.” He got his sister her own book that was more appropriate for her and she gladly gave him his book back. They sat there for a while and then traded! The Wheel of Choice below is from a program created by Lynn Lott and Jane Nelsen (illustrations by Paula Gray). 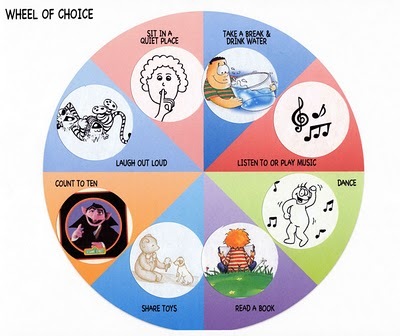 It includes 14 lessons to teach the skills for using the Wheel of Choice. Click Here to get a more complete description and to order your own Wheel of Choice: A Problem Solving Program. 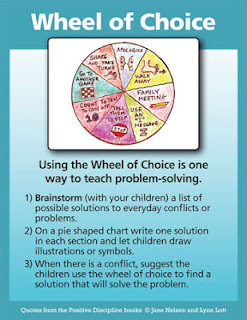 After teaching all the lessons to her students, and having them color their individual slices of the wheel after each lesson, one teacher asked her students to choose their four favorite solutions from the their wheel of choice. They then cut them out and made mobiles to hang above their desks so they could look up and remember their favorite solutions to conflict. 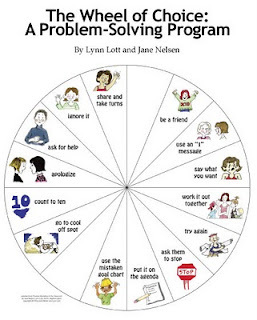 Kids are great at focusing on solutions when we teach them problem-solving skills.